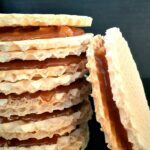 Caramel Wafers Recipe, my favourite sweet treat ever since l was a child. Crispy wafer sheets, crunchy walnuts and delicious sticky caramel filling, all in one amazing dessert. Sounds too good to be true? Believe me, it is true, and you can get it done in about 30 minutes or so. The joy when l find some Romanian products in the UK. Ah, it fells like home all over again. I’m like a child who gets excited to find the hidden box of candies. I’m sure you can all relate, there is no better feeling than enjoying food that reminds you of good old days. There is this big shop in the town centre where you can find Eastern European products, and, to my surprise, they have a pretty good range of goodies. Finding these wafer sheets was like striking gold. l knew exactly how to put them to good use. Of course, you can buy wafers with ready-made filling, but wait, you have to try my filling first, and l bet you’ll just love it. The caramel filling is a tad different from the good old caramel sauce. We need a thicker, stickier consistency, so that we can sandwich two wafers together. It’s not difficult to make it, but you do have to keep a close eye on it. So, we first need some plain wafer sheets, which can be purched from the international aisle in any big supermarket. NOTE! Do not increase the heat, otherwise the caramel will burn quickly! It needs to cook on a low heat, even if it takes some time. 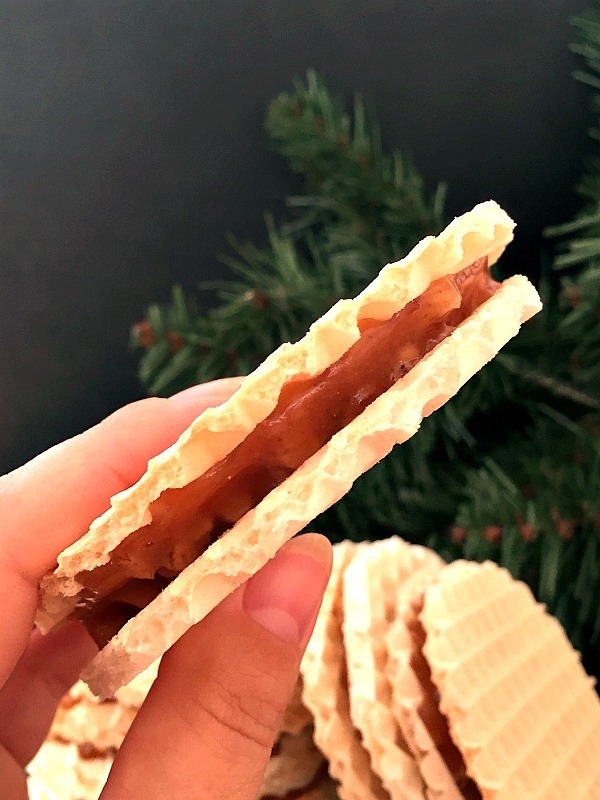 Leave the wafers aside for at least 2-3 hours, the caramel with harden and the wafers will soften slightly, given us the best caramel dessert you can get. 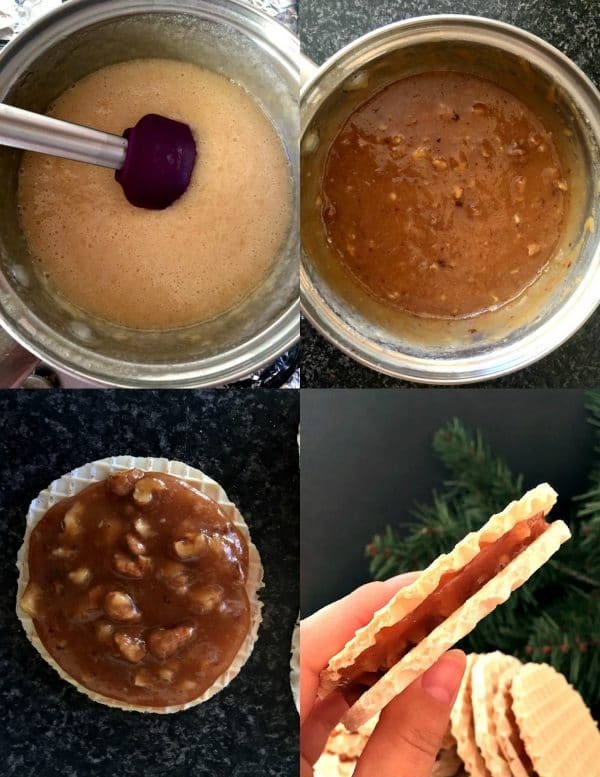 If you’ve liked my CARAMEL WAFERS RECIPE or any other recipe on the blog then don’t forget to rate the recipe and let me know how you got on in the comments below, I love hearing from you! You can also FOLLOW ME on FACEBOOK, and PINTEREST to see more delicious food and what I’m getting up to. 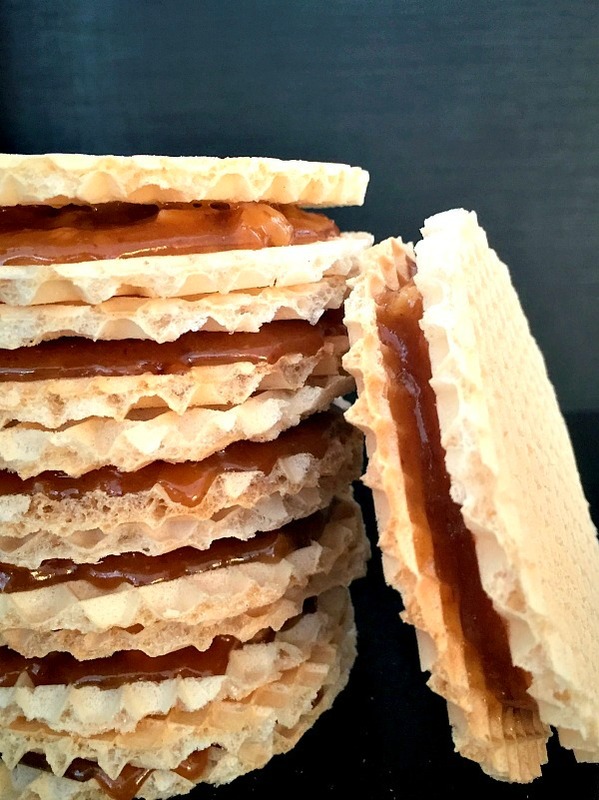 Caramel wafers recipe, a fantastic childhood dessert that is so crunchy and scrumptious. Place a non-stick pan on a low heat and mix in the caster sugar and water. Leave to caramelise for 20-25 minutes, it is important not to bring the heat up, as the caramel can burn quickly. Use a hand mixer to beat the butter and icing sugar until soft, then add the eggs one by one and mix well until incorporated. 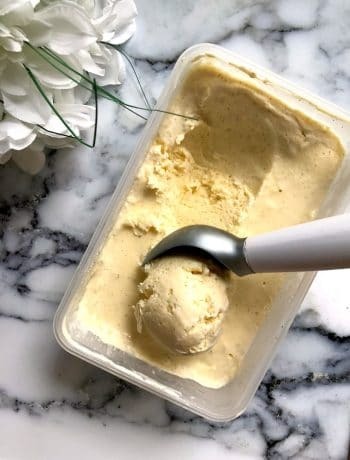 Once the caramel has a light brown colour, add the butter mixture and whisk well for 5 minutes until the smooth and has a darker brown colour. Remove from the heat, mix in the chopped walnuts. Sandwich two wafer sheets together by spreading the caramel and walnut filling on each side. Leave to cool completely, then refrigerate for at least 2-3 hours before serving. Great combination: caramel and walnut! These would not last a minute in my house. Yes, these do look delicious. There would be an empty dish in a flash! A must do, on my list. 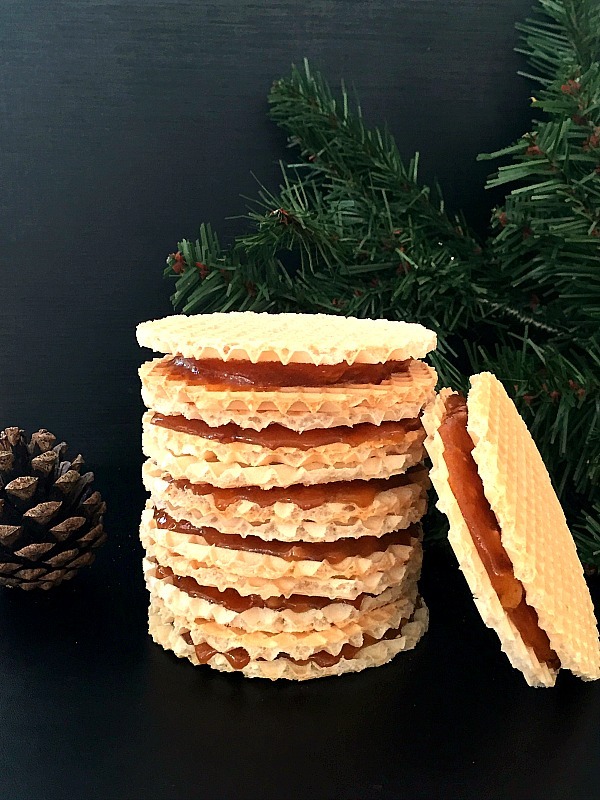 These wafer cookies look so incredibly divine! I can’t wait to impress my friends with this for our cookie exchange! Thank you, Luci! I am sure they will like them ? These are gorgeous cookies! 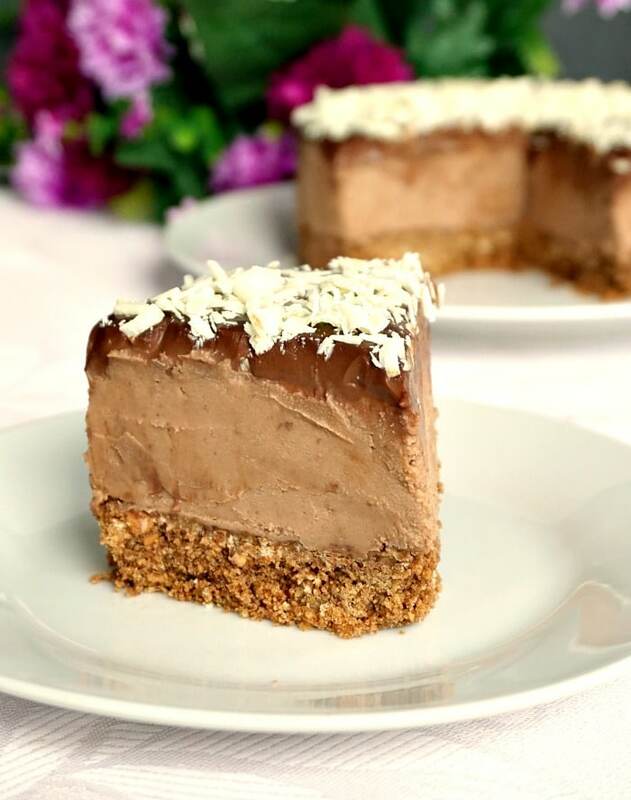 The flavor combination and appearance make these ideal for the holidays! It’s all I can do not to make these right this minute. They look SO divine! 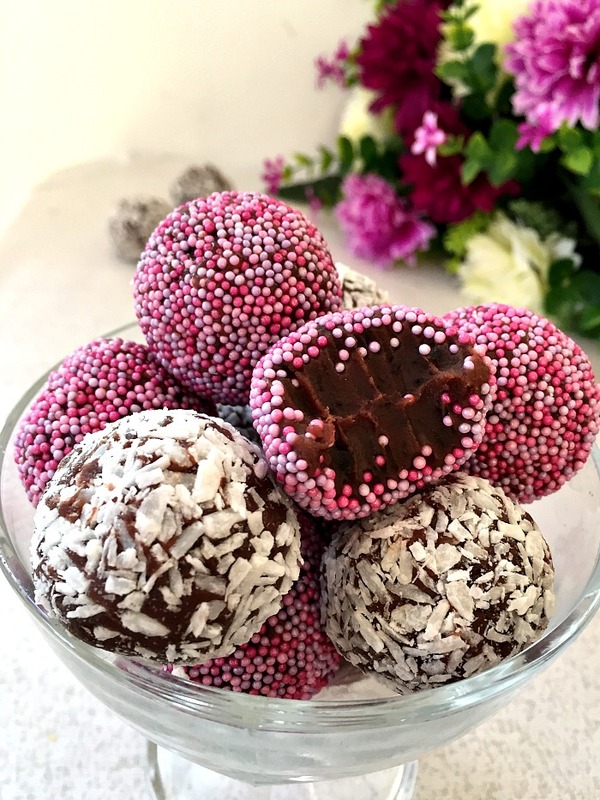 They are really delicious,l’m sure you’ll love them! ?